Not to be confused with Endgame: Singularity. 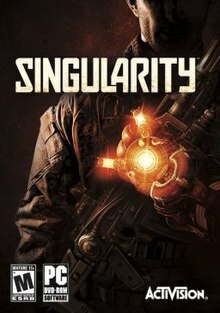 Singularity is a 2010 first-person shooter video game developed by Raven Software and published by Activision and released for Microsoft Windows, PlayStation 3 and Xbox 360. Singularity is Raven Software's third title built on Epic Games' Unreal Engine 3. This was the last original IP the company had worked on before exclusively working on the Call of Duty series. The game begins when an electromagnetic surge from an uninhabited island called Katorga-12, once held by the Soviet Union, damages an American spy satellite. A group of U.S. Recon Marines, which includes the protagonist, Captain Nathaniel Renko, goes to investigate. Another surge disables the unit's helicopter, and it crashlands on Katorga-12. Following the crash, Renko begins to phase between the present and 1955, the date of a catastrophic accident on the island. He arrives in 1955 just in time to save a scientist named Nikolai Demichev (Steve Blum) from dying in a fire. As he rescues Demichev, a man tries to warn Renko not to save him; the man is then killed in the fire. Back in the present, Renko discovers that Demichev has taken over the world. He is captured by Demichev's soldiers, but is rescued by Kathryn (Kari Wahlgren), a member of a resistance group called Mir-12. Based on a journal the group found on Katorga-12, Mir-12 believes that Renko can put an end to Demichev's reign using the Time Manipulation Device (TMD) developed by Victor Barisov (Graham McTavish). Barisov was killed by Demichev in the past, so Renko uses the TMD to save Barisov. Back in the present, Renko and Barisov determine that they can set history right by returning to 1955 and destroying Katorga-12 with a bomb made from E-99, the material that caused the catastrophic accident in 1955. Renko and Kathryn manage to find such a bomb, but Kathryn is lost as they retrieve it. They use the bomb to destroy the island, and thus, the research facility that Demichev used to become so powerful. Back in the present, Renko finds Demichev holding Barisov at gunpoint. Demichev reveals that he rebuilt the facility after it was destroyed, so that history remained unchanged. Barisov realizes that it was Demichev's rescue that changed history, so he asks Renko to go back and stop his past self from saving Demichev. Demichev, in turn offers Renko a place in his empire in exchange for the TMD. He also points out that Barisov's plan has failed before – the mysterious man who told Renko not to save Demichev in 1955 was Renko himself. At this point, the player has a choice. If Renko shoots Demichev, he goes back in time to stop himself from saving Demichev in the first place. In order to do so, he decides to kill his past self. In the epilogue, the game starts again from the very beginning, and Renko is sitting inside the helicopter that is searching the area. However, the mission is soon aborted and declared to be a false alert. They fly past a giant statue of Barisov. It is implied that he recovered the TMD and used it to conquer the world himself. If Renko instead shoots Barisov, he and Demichev rule the world together. After some time, Demichev begins to fear Renko's growing power, and a new cold war develops between the lands ruled by Renko and those ruled by Demichev. If Renko shoots both Demichev and Barisov, Renko allows the world to fall into chaos. Later, he rises up as a new world leader, using the TMD to assert his power. A post-credits scene then shows a wounded Kathryn, pulled into 1955 by a time distortion, writing the Mir-12 journal which will later be used to track down Renko. Singularity is a first-person shooter with survival horror elements. A main gameplay device is an artifact known as the Time Manipulation Device (TMD). The TMD is powered by an E-99 core, and can manipulate time. The TMD can move an object backwards or forwards in time, attract something and hold it indefinitely, or send a pulse of energy that can stun or kill enemies. The TMD can only affect living beings or objects that have been in contact with E-99. Some living beings, like the Spetsnaz troops who are covered in heavy armor designed to repel E-99, are immune as well. The TMD can be used in conjunction with special power stations scattered across the island that greatly amplify its power, allowing it to affect objects much larger than it can normally control such as collapsed bridges or shipwrecks. Singularity's concept was based on Brian and Steve Raffel's memories of the Cold War era and exploration of old abandoned buildings including a World War II military base in the vicinity of Madison, Wisconsin. Some aspects of the game, especially the 1950s sections were inspired by pulp sci-fi movies. According to Keith Fuller from Raven Software the game had a troubled development and was almost cancelled by publisher Activision. Singularity received "generally favorable reviews" on all platforms according to the review aggregation website Metacritic. Activision was disappointed with Singularity's sales, which came out under 400,000. Destructoid sang the Xbox 360 version's praises, stating that: "Singularity is a game that manages to feel like its own thing despite being pieced together from previous FPS games, and if you want a great Summer[sic] shooter full of violent toys and silly super powers, then you won't get much better than this. Quite possibly the best new FPS of the year so far." IGN was not so enthusiastic, and said that while "the gunplay is solid and there are a few memorable set pieces", the game is "ultimately limited by a lack of imagination where a neat time-manipulation idea is handcuffed to a by-the-numbers first-person shooter". Some reviewers criticized the game for similarities to other games, such as BioShock. In Japan, where the PlayStation 3 and Xbox 360 versions were ported and published by Square Enix on September 22, 2010, Famitsu gave both console versions each a score of 29 out of 40, while Famitsu Xbox 360 gave its Xbox 360 version a score of one eight, one seven, and two eights for a total of 31 out of 40. The A.V. Club gave the Xbox 360 version a B+ and said that "for a game released to little fanfare, one that's innovative only in an additive sense, Singularity is worth playing for its canny incorporation of the best ideas from the last decade of first-person shooters, and for providing a suitably chilling atmosphere in which to enjoy them." 411Mania gave the same console version eight out of ten and said it "offers a good shooter for people that want a single player shooter to go through. The multiplayer is fun as well, but balancing issues can make the mutants be too powerful in many matches. While many elements in the game have been seen before, Singularity manages to tie them together and produce an enjoyable experience. This shooter is one of the better summer titles this year, and shooter fans should give this a try." The Escapist similarly gave it four stars out of five and called it "a solid and entertaining effort that you'll probably enjoy more than you think you will." The Daily Telegraph gave it seven out of ten and said of the game, "With its varied combat, ridiculous story and outlandish weapons it's a fun and engaging title and it's a real pity that that Activision haven't given it the attention it deserves. If you're willing to overlook its shortcomings and enjoy old school running-and-gunning, Singularity is an immensely satisfying romp." Metro UK similarly gave it seven out of ten and said it was "A little undercooked, but this is still an enjoyable attempt to create a more cerebral shooter in the vein of BioShock and Half-Life 2." Edge gave the game a score of six out of ten and said, "For all Raven's efforts with temporal gimmicks, this is a game which is stuck in the FPS past – but, perversely, in its gun-metal and gore, in its most archaic respects, Raven proves it can just about stand the test of time." ^ Magrino, Tom (April 19, 2010). "Singularity warps to June 29". GameSpot. CBS Interactive. Archived from the original on April 22, 2010. Retrieved May 19, 2018. ^ Bakedgoods (June 15, 2010). "E3 2010 Interview: Raven Software's project lead chats about Singularity". N4G. Retrieved July 13, 2014. ^ Carless, Simon (July 8, 2010). "Interview: Raven's Vondrak Talks Challenges, Opportunities In Singularity". GameSetWatch. UBM plc. Retrieved February 25, 2018. ^ Fuller, Keith (March 3, 2014). "The Confessional: It took two years to cancel Singularity, and ten months to fix it". Polygon. Vox Media. Retrieved February 25, 2018. ^ a b Sterling, Jim (July 11, 2010). "Review: Singularity (X360)". Destructoid. Enthusiast Gaming. Retrieved July 13, 2014. ^ Bramwell, Tom (June 25, 2010). "Singularity (Xbox 360)". Eurogamer. Gamer Network. Retrieved May 20, 2018. ^ a b c Reiner, Andrew (August 2010). "Singularity: Falling down a rabbit hole with recognizable lining". Game Informer. No. 208. GameStop. p. 108. Retrieved May 19, 2018. ^ Cabral, Matt (July 6, 2010). "Singularity (X360)". GamePro. GamePro Media. Archived from the original on March 20, 2011. Retrieved May 20, 2018. ^ a b c Kuulei N. (July 19, 2010). "Singularity Review". Game Revolution. CraveOnline. Archived from the original on October 12, 2015. Retrieved May 20, 2018. ^ VanOrd, Kevin (June 30, 2010). "Singularity Review (PC)". GameSpot. CBS Interactive. Retrieved May 19, 2018. ^ a b VanOrd, Kevin (June 28, 2010). "Singularity Review (PS3, X360)". GameSpot. CBS Interactive. Retrieved May 19, 2018. ^ "Singularity Review (PS3)". GameTrailers. Viacom. July 6, 2010. Archived from the original on February 2, 2013. Retrieved May 19, 2018. ^ a b c Bakehorn, Cliff (July 1, 2010). "Singularity review". GameZone. Archived from the original on April 23, 2011. Retrieved May 20, 2018. ^ a b Gerstmann, Jeff (July 8, 2010). "Singularity Review (PS3, X360)". Giant Bomb. CBS Interactive. Retrieved May 20, 2010. ^ Brudvig, Erik (June 29, 2010). "Singularity Review (PC)". IGN. Ziff Davis. Retrieved May 19, 2018. ^ a b c Brudvig, Erik (June 28, 2010). "Singularity Review (PS3, X360)". IGN. Ziff Davis. Retrieved May 19, 2018. ^ a b Kolan, Patrick (June 29, 2010). "Singularity AU Review (PS3, X360)". IGN. Ziff Davis. Retrieved May 19, 2018. ^ Kietzmann, Ludwig (June 28, 2010). "Review: Singularity (X360)". Engadget (Joystiq). Oath Inc. Retrieved May 19, 2018. ^ "Singularity". Official Xbox Magazine. Future US. September 2010. p. 84. ^ Francis, Tom (September 2010). "Singularity review". PC Gamer UK. Future plc. p. 79. Retrieved May 20, 2018. ^ "Review: Singularity". PlayStation: The Official Magazine. No. 37. Future plc. October 2010. p. 81. ^ a b Horton, Philip (July 12, 2010). "Singularity video game review (X360)". The Daily Telegraph. Telegraph Media Group. Retrieved May 19, 2018. ^ a b Funk, John (July 15, 2010). "Review: Singularity (X360)". The Escapist. Defy Media. Retrieved May 19, 2018. ^ a b "Singularity for PC Reviews". Metacritic. CBS Interactive. Retrieved May 19, 2018. ^ a b "Singularity for PlayStation 3 Reviews". Metacritic. CBS Interactive. Retrieved May 19, 2018. ^ a b "Singularity for Xbox 360 Reviews". Metacritic. CBS Interactive. Retrieved July 31, 2010. ^ Parfitt, Ben (August 6, 2010). "Singularity and Blur 'fell short'". MCV. NewBay Media. Archived from the original on September 20, 2010. Retrieved May 19, 2018. ^ Strick, Robert (February 4, 2011). "Review: Singularity". PopGeeks. Retrieved May 19, 2018. ^ "シンギュラリティ (PS3)". Famitsu (in Japanese). Enterbrain. Retrieved May 19, 2018. ^ a b "シンギュラリティ (X360)". Famitsu (in Japanese). Enterbrain. Retrieved May 19, 2018. ^ Williams, Christian (July 19, 2010). "Singularity (X360)". The A.V. Club. The Onion. Archived from the original on February 13, 2013. Retrieved May 19, 2018. ^ Larck, Adam (July 30, 2010). "Singularity (Xbox 360) Review". 411Mania. Archived from the original on January 7, 2011. Retrieved May 19, 2018. ^ Hargreaves, Roger (June 28, 2010). "Games review: Singularity tries to be the thinking man's shooter (X360)". Metro UK. DMG Media. Retrieved June 1, 2018. ^ Edge staff (July 5, 2010). "Review: Singularity". Edge. Future plc. Archived from the original on July 10, 2010. Retrieved May 19, 2018. This page was last edited on 13 April 2019, at 20:05 (UTC).